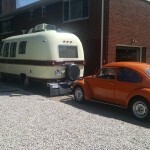 Well the day has FINALLY arrived when I was ready to hook up the dinghy (1974 VW Beetle) to the Argosy (1977). I built the rock guard last weekend and installed it so I can remove it. I don’t plan on always taking the Beetle and I want the option to remove the rock guard. I tested the magnetic brake lights the weekend before that. 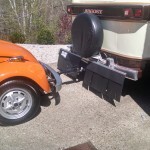 The tow bar goes under the front bumper and attaches to the front frame. Pretty easy setup BUT you do have to lay on the ground to get the pin in the assembly. 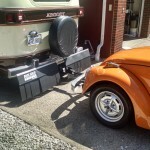 The aligning of the bar to the hitch ball was tricky since there is no play in the tow bar but fortunately the Beetle is so light that I could pull it back and forth even with Monique sitting the driver’s seat and steering to get it lined up with the hitch! The first road test is this Saturday, April 18, 2015. We are taking a short drive (2 hours) to a nearby state park. Our rolling version of ‘that 70’s show‘ starts Saturday! 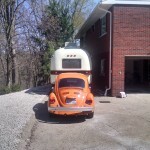 This entry was posted in Articles, Our Argosy 20' Motorhome by Fred. Bookmark the permalink.